This credit-bearing HKU course was established in 2010 to focus on urgent architectural and urban issues confronting Asian cities today. This Faculty of Architecture University of Hong Kong immersive course is designed to expose students to daily learning activities including lectures, seminars, studio crits, field work, firm visits, and design reviews. The nature of work ranges from critical reading of texts, individual assignments, to design and research collaborations. Students will get to interact with professors, researchers, critical practices, think tanks and various local stakeholders in the making of Ho Chi Minh City and Singapore. This programme welcomes all university students and recent graduates with an interest in the Asian city. The deadline for enrolment is April 30, 2017. 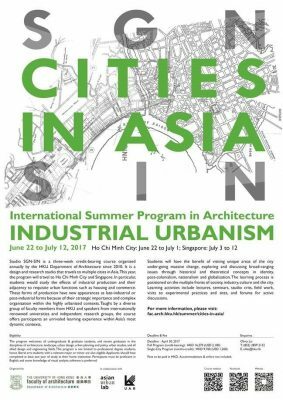 For more details about eligibility and application, please visit: http://fac.arch.hku.hk/summer/cities-in-asia/. Please do not hesitate to contact the programme secretary Olivia Lai for queries: olilai@hku.hk. 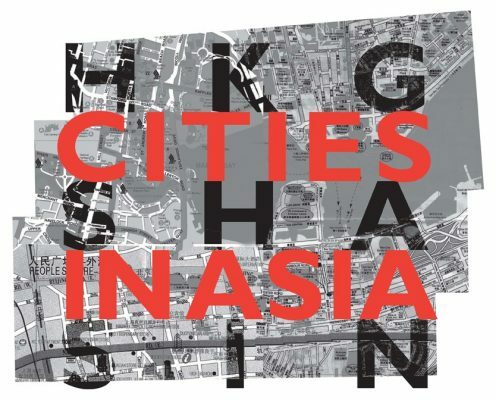 This credit-bearing course will introduce participants to different architecture and building types that have emerged from the current state of rapid urbanization in Hong Kong, Shanghai and Singapore. These urban building types are unique in the way they resist and subvert, or become mutated or subsumed by the prevailing socio-political and economic conditions of the three cities. Participants will learn about new architectural and urban theories and analytical methods that will broaden their knowledge of architecture and the city. The course will expose students to the inter-disciplinary nature of the subject, promoting more diverse attitudes towards difference and change, and encouraging greater confidence in applying the use of such knowledge to design and the broader society. This summer programme is a four-week design and research studio organized by the University of Hong Kong Faculty of Architecture. Taught with daily learning activities by a diverse group of faculty members from the University of Hong Kong, and speakers from internationally renowned universities and independent research groups, this course offers participants a design studio experience within Asia’s most vibrant contexts. Positioning Hong Kong as a launch pad to other Asian cities, this program will link up with the Swiss Federal Institute of Technology (ETH) Future Cities Lab and Asian Urban Lab. All undergraduate & graduate students, recent graduates in the disciplines of architecture, urban design & urban studies. Minimum one year in home university, having taken relevant course in topics related to architectural design studio, urban design studio, landscape design studio, architectural history, urban history or urban studies. Online university transcripts are required to demonstrate this. Demonstration of English proficiency is required. Studio SHA-HKG-SIN is a three to four-week design and research studio organized by the University of Hong Kong Faculty of Architecture in the cities of Shanghai, Hong Kong and Singapore. Taught by a diverse group of faculty members from the University of Hong Kong, and speakers from internationally renowned universities and independent research groups, the course offers participants a design studio experience within Asia’s most vibrant contexts. The International Summer Program in Architecture positions Hong Kong as a launch pad to other Asian cities, linking strategically with the cities of Shanghai and Singapore. This summer program has the benefit of tapping into the vast wealth of expertise from the Swiss Federal Institute of Technology (ETH) Future Cities Lab and Asian Urban Lab. A number of the urban sites and studies designed for this program will be linked to ongoing research undertaken by design studios at the ETH, NUS, SUTD and MIT. Since its inception in 2008, HKU academic programs in Shanghai have benefitted from exchanges and joint studios with leading universities such as Columbia, Harvard, Princeton, Yale, NYU, AA, ETH and EPFL, as well as regional universities such as Tongji, China Academy of Art, Tianjin and others. Through this course, participants will focus on different architecture and building types that have emerged from the current state of rapid urbanization. These urban building types are unique in the way they resist and subvert, or become mutated or subsumed by the prevailing urban conditions of Shanghai, Hong Kong and Singapore. The design and research studio would be based on the examination and re-invention of a number of these building types. Participants will have the benefit of visiting numerous cities under-going massive change, exploring broad-ranging issues such as identity, migration, cultural production, colonialism, nationalism and globalization through topics in architecture and urban history and theory. This program will include study trips to the cities of Hangzhou, Ningbo, Suzhou and Shenzhen. In support of the design and research studio, a regular lecture and seminar program will further enrich the participants’ knowledge in these fields. April 18, 2017 in Events.